Here’s what some folks are saying about rpgKids, the role playing game for kids that everyone’s talking about, featured on BoingBoing, Wired.com, and CNN.com! @dreadgazebo: This is an awesome system you guys, I was given the honor of play testing this new system and it’s great. I played with a 4 year old, a 6 year old and a 9 year old (all boys) and they had a blast. It’s the perfect balance of simplicity and creativity for the more diminutive versions of ourselves. The system provides a great architecture to springboard young kids into RPG’s. Definitely worth grabbing a copy! @Accidental_Rob: my 4 yr old LOVED it… Thanks for RPGkids! SarahDarkmagic.com: Overall, I think it’s a great game for young children. It provides just enough of a framework to give it some structure and order, while allowing the imagination to run free. To be honest, I’m half tempted to play it as an adult, for those times when we just want to play a game. Dicemonkey.net: With the release of rpgKids 1.5, there’s no reason not to get your kids into RPGs….. The game is a simple, straightforward role-playing game to teach kids concepts such as math, taking turns and rational thinking. It encourages the use gridded maps and miniatures, which I approve of, because I think it engages a child’s tactile and visual senses. NBNeil @ rpgnow.com: rpgKids is a fantasic product for getting young children into gaming. It uses very simple mechanics that make it easy for children to learn and play the game, but also helps strengthen their math skills. Andrew @ rpgnow.com: I bought this on a whim and my kids love it. My oldest is 5 and can’t get enough of it. His sister (just turned 3) loves listening to the story unfold and cheers the hero along. She also ‘rolls’ for the monsters. So simple. So much fun. David: I just read through the book. Not only are the rules pretty tight for their simplicity, I really appreciate the blank grid page and the other maps included. Beyond running a game of RPGkids, I’d love to play the Frog Wizard story in D&D. It’s really funny. Great work. Mark G.: Please feel free to quote me! I hope other geek parents can enjoy this with their kids too. It was a great way for him to use his imagination, do some crafts, spend time with his parents doing something they like doing, and the basic math involved applying modifiers and comparing dice rolls is great for someone his age. Gnome Stew: I’d recommend rpgKids to any gamer who wants to introduce their children to RPGs, even if they’re a bit outside the recommended age. It’s simple fun and easy, and lets your children see the fun of RPGs without complicated mechanics getting in the way. RPG Musings: …I like where this game goes, and fully recommend it. If you have a young child that loves fantastical storytelling, this is one of your best options. Mike @ datanode.net: To say we had an absolutely awesome time as my two girls led their two characters… against a pair of trolls is to put it mildly. Wired.com’s Geek Dad: rpgKids provides an experience that young children will absolutely love, and the time you will spend teaching them about gameplay, math and the power of storytelling is worth far more than the $2.99 price tag. Trust me. 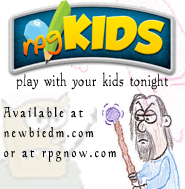 Welcome to the rpgKids page here at NewbieDM.com. The first release of rpgKids last year was a big success. I received many emails about it, and blogs even went up related to parents playing it with their kids and introducing their small children to role-playing games for the first time ever. It was both a little humbling and flattering at the same time to see something I created getting enjoyed and played with like that. I did have some minor issues with the game though, and felt a small revision was in order. That’s why you see this 1.5 version of rpgKids. If you’ve played the game before, it’s pretty much unchanged, except I took a few tweaks that people had been making and applied them to the rules. I also added a healer, which seemed to be needed. If you’ve never played the game before, well here’s a description in a nutshell: A very simple RPG consisting of opposed die rolls using a d12, while encouraging kids to think creatively, perform simple arithmetic, and have fun! 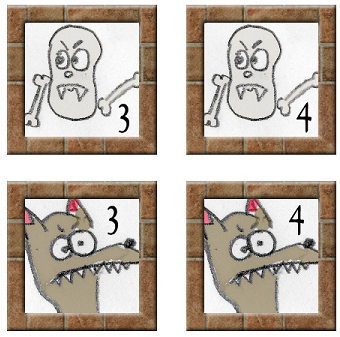 Fun hand drawn tokens are included with the game. The fully bookmarked, 24 page PDF also includes funny and kid friendly hand drawn tokens for both heroes and monsters, character cards and a printable 1″ grid. But that’s not all, because it also includes a full introductory adventure, designed to show all the rules of the game at work, within the context of a fun quest. All in all, it’s not a bad deal! rpgKids is suitable for kids from 4 years old, up until they can grasp a more complex game like D&D or some other rpg. You can purchase the game right here via Paypal for only $2.99. Once it goes through, I’ll send out a download link via email. It may be instant, or sometime later, as I have to do these one by one depending on when it’s processed. I promise to be as quick as I can in sending the link out though, you have my word. The game is available via RPGNOW as well, where you’re able to download it instantly. And now, I’m pleased to announce the release of the rpgKids Adventure Pack 1, a collection of four fun adventures for the rpgKids game, exclusively available at rpgnow.com! The Curse of the Sleepy Mist – The evil wizard Geleron has released a magical mist that has put the entire town of Springwell to sleep. Can the heroes of Springwell defeat him yet again and make everything right in Springwell? Trixie the Unicorn’s Rescue – The fairies of the Evergreen Forest need help, as their unicorn, Trixie, has been taken prisoner by the evil goblins of the Dark Swamp. Can the heroes of Springwell find her and bring her home to her fairy friends? Rescue from Dinosaur Island – A group of explorers left on a boat to the mysterious Dinosaur Island but never returned. Can the heroes find them and bring them back home to Springwell? The Pirates of Seaweed Cove – It seems pirates have been attacking ships off the coast of Springwell’s beach, teaming up with Shark‐Men from under the sea. Can the heroes stop the pirates and the Shark‐Men before everyone becomes too scared to go out on boats? The rpgKids adventure pack is available at rpgnow.com for only $3.99! You can also purchase a bundle of the original rpgKids release, plus the Adventure Pack for only $4.99 (a $2 savings)! That’s the game plus 5 adventures for less than a buck! 2,520,377 new DM's have visited newbiedm.com!